I am seriously falling behind with my main modelling project of 2008, a South American narrow gauge line in On30, but as this will also be O scale it will compliment rather than clash and I can work on both together. OK, it needs a bit of imagination to convert the Blutac mock up into the bonnet and radiator but just humour me for now. I will not need a large O9 fleet, just the loco and a handful of dollies like the one shown in the picture (actually Gn15 but about the right size). These will have a little fork layout to operate on, something like my Port Abel but about twice the scale and half the size. As one layout goes another is born! SWMBO is out at band practice so I've got a bit of work done on the layout. The baseboard has been assembled with a sector plate at the off stage end giving access to a third siding making the layout an Inglenook(ish) design with a loco and two on the sector plate and siding capacities of three, one and one though a wagon can be left on the turnout during shunting making the layout capable of holding the loco and four wagons. Scenically I plan to have the front retaining wall higher than the one at the rear giving the impression of looking downhill onto the yard. The end furthest from the sector plate will have a low relief goods shed with dummy doors for both the standard gauge and the front narrow gauge sidings. The road bridge acting as a scenic break will be skewed and slope down away from the viewer. The layout measures 18½ by 9 inches, with the sector plate extending another 3½ inches. Note that the standard gauge wagon is low relief, as in it has no underframe. This deception will be hidden by its close proximity to the goods shed, the loading bank in front of it, and weeds overhanging the buffer stop between the wagon and the small shed. The narrow gauge wagon in the photo is an old Tri-ang OO body on an N scale caboose chassis which is exactly the same length. It is wonderful what turns up in the scrapbox when I have a good rummage. You are a bad man Bob, bring all these good ideas to light. So far i have managed to bash up a Keef skippy look a like (see pic below) no wagons to unload but i was thinking that flat wagons with supplies and track could be shunted/moved around when the loco/tipper is not filling up the big wagon. Looks like i am going to have to finish it now! Thats a big layout Bob complex aswell, it has a turnout . Looks like fun though and a really good way to get an inglenook type puzzle into a small area. I'm guessing you are going to make a compressed version of the Motor Rail loco (the photo is a rebuild by Hibberd) as they were pretty big, 8' 9" long and just shy of 5' wide. If you are looking for something a little smaller and simpler, with the same transverse engine layout, I can probably find a picture of a similar Hunslet design (think I know where the book is ), not quite as much character though, as it has straight frames, rather than bowed out. Much easier to model . Bob you need to go to rehab! you have a serious addiction there! another layout?? It looks very good... lets see how this one goes! I was originally thinking along the lines of the garden shed on wheels that Simon Andrews was running on Black Hall Sidings but I like the Motor Rail because it is an open design which would do justice to the low motored Kato chassis. It will probably work out as quite a large critter anyway as I'm not going to alter the chassis so it'll need to be about 8ft scale long and wide enough to look right with the Tri-ang wagon which is around 4ft 3in wide in O scale. Maybe Motor Rail built it as a one off for Lord Hayfinch and he specified the size to fit into his loco shed? The usual Blackcloud Bodgery applies, as does the My Railway rule whereby I can do what I like. And that is a problem because....? It is a good job I have SWMBO to keep me in check otherwise the house would be overrun with railways. the bent frame simplexes where about 8'3" by 4' 6".. I know casue i measured some and the 20/28hp where 7'6"x4' which is handy for my current task! but they all vareid with gauge so youll be okay! mogbass01 wrote: the bent frame simplexes where about 8'3" by 4' 6".. I know casue i measured some and the 20/28hp where 7'6"x4' which is handy for my current task! but they all vareid with gauge so youll be okay! Maybe Lord Hayfinch (in true upper class twit fashion) forgot to mention the gauge when he ordered his loco. So the estate workshop had to regauge it on arrival with the original drive being retained. While looking for something else I have just found an O scale Mack bonnet sent by a friend in the US which could well feature as part of a freelance loco. Anyway, whatever it turns out to be it will be built to match the available loading gauge and fouling points on the sidings, which are designed for rolling stock of about 4ft 3in width (ie the Tri-ang OO wagon's size). As long as it looks OK it will do. I have been using modelling clay to form the hedgerows on Foxbaile (my OO boxfile layout) so while I had the tub on the desk I have made a rough form for the engine cowl on the Motor Rail style loco. I can't do anything else with it until the clay dries so I've been looking at the wagon fleet. 1. Open, can be sheeted for dry goods if required. Tri-ang OO body on 36ft N caboose chassis. This wagon just needs painting and a brake wheel adding. 2. Gondola, mainly for agricultural produce (potatoes etc) but can also be used for general goods. American HO body on stretched 40ft N boxcar chassis. Requires painting and a bit of filler to disguise the splice in the underframe. Yes, it does fit on the sector plate with the loco chassis and another ex N scale 40 ft chassis, JUST. 3. Flat, for heavy machinery and crated goods. Gnomy body (part) on 40ft N boxcar chassis. Requires wooden deck (coffee stirrers) and weathering. 4. As yet undecided. I may use a Gnomy van or a Tri-ang tank on anther 40ft chassis for this wagon. I quite like the look of the three wagons done so far, with the short wheelbase bogies under long frames they have a bit of a WD trench railway look to them. Originally 2ft gauge, which conveniently explains why they're a bit oversize for the minimum gauge line, they were bought by his lordship as war surplus stock (which also explains the American appearance of the gondola). I do like freelancing, you can make it up as you go along. looking good bob.. what colours are you planing? Steve: thats something I didnt know! wouldnt it make them very wobbly? mogbass01 wrote: what colours are you planning? I have quite a few shades of brown in stock from painting the buildings on my OO scale Park Hall Halt module for the CRM exhibition next January so the Hayfinch Estate Rly livery will probably be something drab, almost camouflage, but he flat wagon will have unpainted wood for its deck and if the fourth wagon is a tank it may be either white (for milk traffic) or gunky black (for fuel oil). Incidentally, totally unconnected to this topic other than the OO reference, I read in the paper today that the hospital that Park Hall Halt was originally built for has been voted best NHS Trust hospital in the UK... Even though its local station closed in 1966.
mogbass01 wrote: Steve: thats something I didnt know! wouldnt it make them very wobbly? I really like the wagons you're making though. It's giving me ideas again. How does the Kato chassis run? I've been dithering about getting one for a while. I have not tried my chassis yet as I haven't started tracklaying and can't be mithered to dig an N gauge layout out of the shed to test it on. However, there was a similar chassis running on the stand next to me at Telford show last Sunday. Smooth as the proverbial sewing machine (as to be expected from Kato). Confession time. I have chickened out of making the Simplex type open framed loco (for now) and used an O scale Mack engine cowl given to me by a friend as part of a mixed box of odds and ends. The loco body is only attached to the chassis with Blutac though, so if I do make a Simplex at a later date I can swap and change. I also found a second Tri-ang wagon body in my scrapbox which has been used on another N scale 36ft caboose chassis to create the fourth wagon. The wagon fleet has been painted in the Hayfinch Estate livery, mucky grey, though this varies greatly from one vehicle to another as a different batch of paint was mixed for each - this reflects the estate's policy of non-consistency very well. The wagons still require a little more weathering but I'm happy with the loco's dirty red paint job. Having assembled a small fleet of O9 stock I can now get on with building the layout. 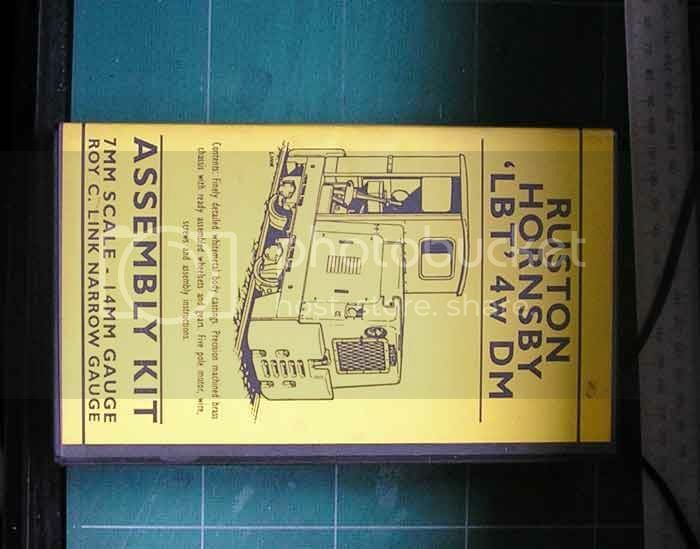 I'll leave it up to you lot to speculate as to whether or not this will get built while I go and have a lie down in a darkened room for a while. Those wagons work very well. Not bad for nothing. Steve Bennett wrote: Does this mean you have to find another layout to scrap to build it, or is it going to be a sneaky addition to the quota? Nah, I'll just hide it on the shelf with the other videos, I can mark the spine with a suitable railway title and SWMBO will never look at it. Have you been making a new layout? What makes you think there's a new layout dear? No, of course not dear. Then what have you been doing in the shed? OK, just don't get any ideas. Has she gone?... Good, take a quick look at this video. Brilliant Bob, love the idea of putting it on the shelf with the rest of the videos. Yes, Roy Link loco kits come in their own layout boxes This just has to be done . Cajavideo is a small naval port somewhere south of Mexico and north of Punta Arenas. The dockyards were originally built by the British and equipped with an 18 inch gauge internal railway system. The British have now left but the railway remains, albeit with an American Mack loco to replace the one that the RN took home with them. A big advantage (which has just occurred to me) of using a VCR box is that the backdrop can be changed at will just by sliding another picture into the sleeve. So if I change my mind about the story above I can rewrite history and replace the backscene. The attempt below is a complete failure due to our printer throwing a wobbly and refusing to do anything other than sepia tones in colour or b/w mode. The backdrop in the sleeve is meant to be the picture on screen. Such things are sent to try us. A loading dock can just be squeezed in between the rear track and the lid. 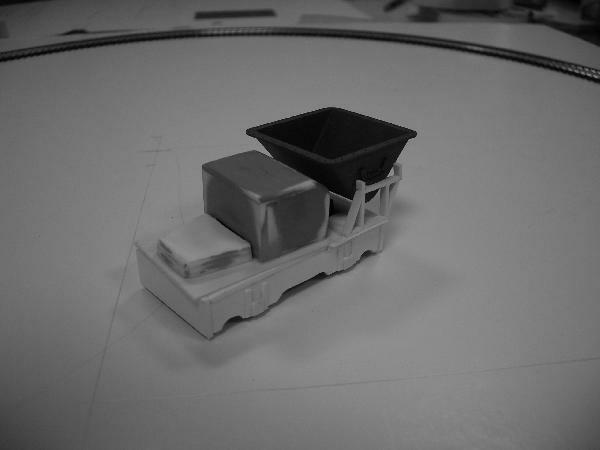 If it comes to slightly less than the height of the flat wagon it will not need to be removable, which is nice, so I'll bodge one up out of modelling clay tomorrow. The locating holes along the front of the box, for the lid to clip into when closed, will be useful for holding a fence to define the front of the layout. bobblackcloud wrote: A big advantage (which has just occurred to me) of using a VCR box is that the backdrop can be changed at will just by sliding another picture into the sleeve. So if I change my mind about the story above I can rewrite history and replace the backscene. I had not thought about changing the scale, but it could well work as long as no fixed items in the scenic area were scale specific. Anyway, enough of the video box frivolity for now and back to the big layout. The Hayfinch Exchange Sidings now have tracks! Peco OO9 with an N scale Set Track turnout. The sleeper spacing on the turnout is not a problem, the estate railway made a habit of using smaller sleepers closer together under its pointwork and it will largely be buried in ballast and weeds anyway. The sector plate's stop blocks were glued and pinned in place before tracklaying commenced to ensure that the track alignment would work properly. The track has been bedded in using modelling clay. It is imagined that the prototype would have been laid on very thin ballast, if any at all, so the clay is meant to make it look as if the track is slowly sinking into the ground. A generous dosage of weeds will compound this effect.